An app providing administrators with the ability to configure the most common network tasks. Depending on the number of physical Network Interface Cards (NIC) present in your server, the server can be configured in standalone (1 NIC) or gateway (2+ NICs) mode. In addition to basic NIC settings like type (DSL, Ethernet etc. 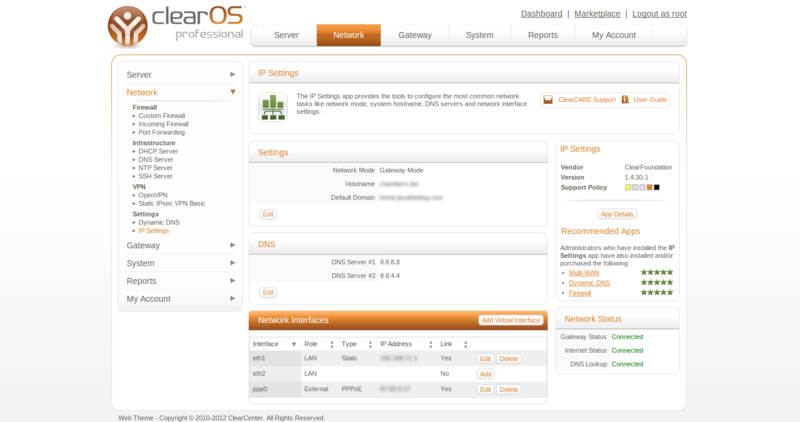 ), role (external, LAN) etc., DNS server settings and virtual interfaces can be configured. The Shell Extension is a account-manager extension that allows an administrator to assign shell access (and type) to user accounts via the user manager app. Giving users shell access to the server is not typically recommended unless the user has a role in administering the server or services (eg. Apache web server) that reside on it. Another typical use case that can enhance security is to disable root logins, forcing users with privileged shell access to login by username. A list of repositories available to the server. A software repository is a storage location where updates and new packages can be downloaded and installed on the server. Apps available in the Marketplace are dependant on which repositories are enabled. Copyright © 2009- ClearFoundation Ltd.